By reducing the liquid fraction and therefore the overall volume of digestate produced, the DCS minimises the economic and logistical challenges associated with digestate storage, transportation and application. Up to 60 per cent less storage capacity is needed and fewer tanker loads are required, helping to curb an AD plant’s transportation costs and carbon footprint. And with an average 1.5 MW AD plant generating 40,000 tonnes of liquid digestate each year, that can mean significant carbon and financial savings. By reusing heat from existing sources, such as the CHP engine, the DCS is virtually energy self-sufficient. Water removed by the process is recovered and can be mixed with AD feedstock at the front-end of the plant, increasing the efficiency of the digester. The DCS also overcomes odour issues and increases the nutrient content of digestate via acid-dosing with sulphuric acid – while the volume of digestate is reduced, the nutrient content actually increases. The post Reduce digestate volumes with HRS appeared first on HRS Heat Exchangers on 6 June 2018. This entry was posted in Copywriting and tagged Anaerobic digestion, HRS Heat Exchangers, waste on 11 July 2018 by Richard. Pasteurisation technology supplied by HRS Heat Exchangers has helped international waste-to-product business Shanks Group plc, gain PAS 110 certification for its Westcott Park anaerobic digestion (AD) facility in Buckinghamshire. Publicly Available Specification 110 (‘PAS 110’) is a demanding industry specification which verifies the quality of digestate (the organic biofertiliser output from the AD process) and covers the product quality, standards for input materials and the management system for the AD process. This important development, which was achieved in April this year,means that the digestate produced by Westcott Park is of a consistent high quality which can be sold and applied as an agricultural fertiliser.The facility also received a Certificate of Compliance by Organic Farmers & Growers Ltd, meaning that the digestate can be used by both conventional and organic farmers to provide nutrients and valuable organic matter to their crops. The Westcott Park facility has the capacity to process 48,000 tonnes of food waste, from sources including the retail and catering sectors, each year and supplies the National Grid with enough electricity to power 6,000 homes. As well as setting limits for physical contaminants, such as plastics, the PAS 110 standard requires pasteurisation of the material before or after it is digested at the AD facility. HRS designed and supplied a HRS 3 Tank Batch Sludge Pasteuriser System to pre-pasteurise the food waste feedstock before it is fed into one of the three digester tanks. The system makes use of heat from the facility’s existing combined heat and power engine which would otherwise be wasted, helping to maximise the overall efficiency of the site. It also recovers heat from the hot feedstock which has been pasteurised and uses it to pre-warm the feedstock as it enters the pasteuriser system. This provides energy savings of up to 70 per cent. Ray Nattrass, Head of Process Design & Engineering at Shanks Waste Management, said: “We chose the HRS system because they offered a complete pasteurisation solution -we wanted the tanks, pumps, control system, control logic and everything built into that. This article was first posted on the HRS Website in August 2015. This entry was posted in Copywriting and tagged Anaerobic digestion, HRS Heat Exchangers, pasteurisation on 13 April 2016 by Richard. Agri-Gen, which is based near Woodbridge in Suffolk, is owned by a consortium of six local farmers who locally grow some 22,000 acres of arable and root crops, such as potatoes, carrots, parsnips and sugar beet. 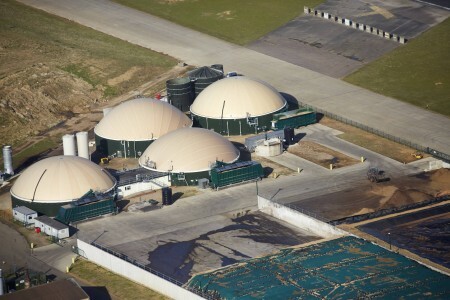 The anaerobic digestion plant is fed with a mixture of agricultural materials including rye, sugar beet, beet pulp, vegetable out-grades and maize, although the farms try to minimise the amount of maize grown. The energy produced by the plant is used, amongst other things, to dry and cold store crops such as potatoes and onions. Graham Thorne of Agri-Gen explains: “The majority of material that feeds our plant is taken from our own land and the digestate goes back to our own land. However, we want to be absolutely certain that we protect our land base, so we do not want to transport crop diseases, pests or weeds across our land base. This is about making sure we don’t have problems. The unit in question is an HRS 3-Tank Batch Sludge Pasteuriser which will treat the digestate between the main digester and storage. The use of a three-tank system means that while one tank is being heated and pasteurised, another is being emptied and the third is being filled, which results in a continuous operation. It is anticipated that the new pasteuriser will be installed and fully commissioned by the end of March 2016. This story first appeared on Energy Management on 3 February 2016. This entry was posted in Copywriting and tagged Anaerobic digestion, HRS Heat Exchangers on 4 April 2016 by Richard. Anaerobic digestion (AD) has become a popular technology in the food processing industry recently, with over 400 AD plants now generating more than 500 MW of energy. However, the potential for UK AD is much greater – according to the Anaerobic Digestion and Bioresources Association (ADBA), up to 80 TWh of methane (equivalent to 30% of the UK’s household gas demand). AD utilises waste streams and co-products, often removing the need to employ other waste treatment technologies. It can provide heat and electricity for processing operations and also produces a valuable end product in the form of digestate biofertiliser. With recent changes to support schemes for renewable energy in the UK, it is important to make sure that every available watt of power is utilised. The best time to assess overall plant efficiency is early in the planning process so that equipment can be appropriately specified. However, the overall efficiency of most AD plants can be further improved in some way by taking into account some common considerations. Assess your entire process from obtaining feedstock to exporting digestate: The first step of any optimisation process is to understand what you are (or will be) doing. Analyse each step to see where wastage may occur and how it could be improved. Would it be useful to pre-warm feedstock before it enters the digester or, if this is already being done, would it be possible to re-use heat already generated elsewhere? Could value be added to the digestate through pasteurisation or concentration? Maximise the efficiency of all processes, from energy generation to heat exchange: Check the efficiencies of all processes in terms of thermal transfer, electrical output or gas generation. Keeping equipment, particularly heat exchange surfaces, clean and maintained will help it to operate at maximum efficiency. When specifying equipment over the operational life of plant the effects of even a small difference in overall efficiency could be considerable. Likewise, reducing the volume of digestate produced by the plant may create other efficiencies, such as reducing the amount of storage required or transport requirements. Re-use heat which would otherwise be wasted: Any large quantity of heat can be used for something, including the heat from the cooling loop of the CHP engine and from heat exchangers. Pre-heating feedstock may increase the efficiency of the digester, while if you are already doing so, using heat from elsewhere in the process will be cheaper (and greener) than creating heat just for this purpose. Pasteurising the digestate using recycled heat circumvents the need to install an additional heat source such as a biomass boiler, which could add hundreds of thousands of pounds to a project. Aim for continuous processing: Having to stop and start a plant can be inefficient, even if the process is automated. Using multi-tank pasteurisation or digestate concentration systems means that while one tank is being heat treated the other/s can be filling or emptying, ensuring that the rest of the AD process is not interrupted. Maximise the quality and value of your digestate: Digestate should be a key product of AD and not something which needs to be dealt with. Maximising its value in terms of nutrients, ease of use and quality will also help to increase its financial value to your business. Pasteurising the digestate not only complies with PAS110, but can act to reassure buyers. Producing digestate of a suitable consistency for agricultural use can also increase its value and usefulness to farmers and growers. Minimise downtime and maintenance: If the plant is not running, then it isn’t generating energy or a return on investment. While routine maintenance and servicing is essential to keep any equipment running well, you shouldn’t have to keep stopping to clean pipes or replace filters. You should also expect equipment to have a reasonable service life and not be prematurely damaged, for example by corrosion. This story first appeared on Industrial Compliance on 26 January 2016. A 5MW farmer-owned anaerobic digestion (AD) plant in Suffolk, UK, has selected HRS Heat Exchangers to supply a new system to pasteurise its digestate — the organic biofertiliser produced by the process. The AD plant is fed with a mixture of agricultural materials including rye, sugar beet, beet pulp, vegetable out-grades and maize, although the farms try to minimise the amount of maize grown. The energy produced by the plant is used, amongst other things, to dry and cold store crops such as potatoes and onions. This story first appeared on Bioenergy Insight. This entry was posted in Copywriting and tagged Anaerobic digestion, biogas, HRS Heat Exchangers on 24 January 2016 by Richard. Demonstrating how to optimise anaerobic digestion (AD) plant performance, HRS Heat Exchangers will showcase their latest ultra-energy efficient Digestate Concentration System (DCS) on stand 2 at Energy Now 2016. With a typical 1.5 MW AD plant producing a much as 40,000 tonnes of liquid digestate each year, plant operators face significant economic and logistical challenges associated with storing and transporting the biofertiliser. The DCS typically reduces the volume of liquid digestate by around 60%, helping operators better manage this natural by-product of the AD process. “The volume and consistency of digestate can quickly become a costly bottleneck in plant efficiency if it isn’t concentrated. Faced with incentive degressions, AD plants must run efficiently with every aspect optimised if they are going to maximise their return on investment,” comments Matt Hale, HRS International Sales Manager. The DCS concentrates liquid digestate, which has a low dry solid content, and increases the dry matter typically from 4% to 10%. This reduces the overall volume of digestate produced, meaning that up to 60% less storage capacity is needed and fewer lorry loads are required helping curb a plant’s transportation costs and carbon footprint. The HRS DCS uses a multi-effect concentration process using forced recirculation to process the digestate. The system works by superheating the digestate in a vacuum to facilitate concentration, coupled with HRS’s corrugated tube heat transfer technology which reduces fouling and reduces maintenance periods. By using a two or three effect concentrator, the low temperature steam which is evaporated can be reused, making the process highly energy efficient. Furthermore, the water removed by the process is recovered and mixed with the plant’s feedstock, increasing the efficiency of the digester and reducing the amount of energy and water used by the AD plant. HRS Heat Exchangers will be on Stand 2 at Energy Now 2016. This post first appeared on Farming Online on Wednesday 2 December 2015. This entry was posted in Copywriting and tagged Anaerobic digestion, Digestate Concentration System, HRS Heat Exchangers on 3 December 2015 by Richard. It is a similar story with the Renewable Heat Incentive (RHI). Tariffs have just become more complex, with larger biomethane combustion plants becoming eligible and a decreasing scale of tariffs on the amount of biomethane injected into the gas grid, but as overall RHI deployment continues to rise, degression is also likely. This does not mean that AD projects are no longer viable. It does however mean that some people’s thought processes need to change. It is worth remembering what the FIT scheme was designed to do. It was supposed to increase the uptake of renewable energy technologies to the point where they were sufficiently widespread that development costs came down to the point that financial support was no longer necessary. They were not intended to be a long term subsidy on energy generation by plants – even if that is how they appear to work in practice. The way the FIT scheme is set up has already caused some (not entirely unforeseen) market distortions. The two most obvious being the installation of multiple smaller units to increase the tariff the project is eligible for (most noticeable with biomass boilers under the RHI) and the over-specification or under efficiency of heat usage technologies, such as driers, in order to maximise the amount of heat on which RHI can be claimed. Heat exchanger systems for digestate pasteurisation and concentration have a strong track record on the energy efficiency front. Pasteurisation of the AD plant’s organic biofertiliser output, digestate, is necessary if the product is to cease to be seen as a waste and be sold as a product (meeting PAS 110 standards). Although the pasteurisation process has in the past been an energy hungry and inefficient process, heat exchanger technology has changed this. The HRS 3 Tank Batch Sludge Pasteuriser System, for example, uses at least half – and in some cases up to 70% – less heat energy to complete the pasteurisation process by recycling heat energy twice. For either new or existing plants, it’s worth investigating heat exchanger technology for pasteurisation and digestate concentration. Not only does it improve a plant’s efficiency and maximise its outputs, but it’s also better for the environment too. This story was first published on Engineering Update on 6 July 2015. This entry was posted in Copywriting and tagged Anaerobic digestion, biogas, HRS Heat Exchangers, RHI on 8 November 2015 by Richard. Malted ingredients company Muntons (Stowmarket, Suffolk) is putting the finishing touches to its £5.4m on-site anaerobic digestion (AD) plant which will help reduce the firm’s CO2emissions from 27,264 to 26,605 tonnes pa. Integral to the success of the 499 kW facility is a 3 Tank Batch Sludge Pasteuriser System with Energy Recovery from HRS Heat Exchangers, which will help convert up-to 80,000 tonnes of Muntons’ liquid malt waste into quality organic fertiliser (known as digestate). This will be used on local farmland, helping the company’s network of growers to produce some of the 250,000 tonnes of barley needed to make Muntons’ malt, around 180,000 tonnes pa.
Muntons is a company with sustainability at its core. It became interested in AD after analysis showed that 60% of the carbon footprint of its supply chain came from the artificial fertiliser used by its barley growers. The firm realised that using its liquid malt waste as feedstock for an on-site AD plant would not only produce a high quality digestate for its farmers to use instead of artificial fertiliser, it would also cut 3,000 tanker movements per year and generate 25% of the site’s electricity demand. To satisfy growers’ need for a high quality fertiliser, the digestate will be pasteurised to meet stringent PAS 110 standards using the HRS Heat Exchangers 3 Tank Batch system. As well as a comprehensive proposal, the Muntons’ team was impressed by the HRS system, which can save up to 70% of heat required, as well as its ability to run at a half flow rate, should the volume of digestate stock reduce. Additionally, the equipment’s monitoring feature enables Muntons to track every batch of digestate back to the feedstock from which it was produced. “The fact that the HRS system offers batch reporting was also a big draw; traceability is very important to us,” remarks Lawrence Howes, Project Engineer at Muntons. The HRS system works on a three tank principle; while one tank is being filled, the second tank holds the sludge at 70°C at the same time as the third tank is being emptied (each process lasts one hour). Waste cooling water from the CHP engine is used to heat the sludge in corrugated tube-in-tube heat exchangers, which is more efficient than heating an entire tank of digestate. 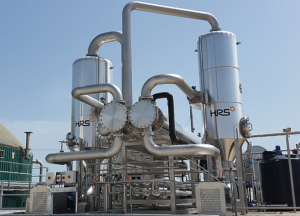 HRS has also incorporated an energy recovery section into the process to make it even more efficient: energy is transferred from the hotter (pasteurised) sludge to the colder (unpasteurised) sludge, reducing energy consumption by up to 70% compared to normal systems and using heat which would otherwise be wasted. The AD plant is currently undergoing commissioning and will become fully operational in late spring. For Muntons, the benefits are clear – better waste management, a reduction in tanker movements, energy generation, and a PAS 110 quality pasteurised digestate. All in all Muntons has significantly reduced its carbon footprint saving 1159 tonnes of CO2 pa (from 27,264 to 26,605) – the emission equivalent of 300 average family cars (approx.). This post first appeared on The Sustainable Engineer in March 2015. This entry was posted in Copywriting and tagged Anaerobic digestion, HRS Heat Exchangers, Muntons, Stowmarket on 7 May 2015 by Richard. 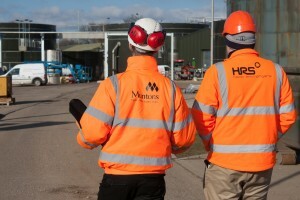 Maltster and malted ingredients company Muntons is putting the finishing touches to a £5.4m anaerobic digestion (AD) plant at its Stowmarket site in Suffolk. This will help turn up to 80,000 tonnes of liquid malt waste into a high quality bio-fertiliser while helping reduce Muntons’ CO2 emissions by 1,159 tonnes a year. The bio-fertiliser by-product of the AD process, known as digestate, will be used on local farmland, helping the company’s network of growers to produce some of the 250,000 tonnes of barley needed to make around 180,000 tonnes of Muntons’ malt each year. Muntons is a company with sustainability at its core. Analysis showed that 60% of the carbon footprint of its supply chain came from the artificial fertiliser used by its barley growers. Unlike many AD projects where digestate is something of an afterthought, for Muntons it would help the firm meet its sustainability criteria. The firm realised that using its liquid malt waste as feedstock for an on-site AD plant would not only produce a high quality digestate for its farmers to use instead of artificial fertiliser, it would also cut 3,000 tanker movements per year and generate 25% of the site’s electricity demand. Spreading 80,000 tonnes of liquid waste from Muntons’ processing plant to land was resulting in some 3,000 tanker journeys each year. The new treatment plant will remove the need for these journeys, plus it will capture nutrients such as phosphate which was previously lost when treated effluent was discharged to the river. The digestate is high in organic matter and will act as a soil conditioner and improver, and will have a wider application window than the liquid waste previously produced. The digestate will be pasteurised to meet stringent PAS 110 standards using the HRS Heat Exchangers 3 Tank Batch system. Based on the plant’s feedstock derived from barley or water, pasteurisation ensures that the final fertiliser is free from plant pathogens or other biological contaminants. As well as a comprehensive proposal, the Muntons’ team was impressed by the HRS system, which can save up to 70% of heat required, as well as its ability to run at a half flow rate, should the volume of digestate stock reduce. Additionally, the equipment’s monitoring feature enables Muntons to track every batch of digestate back to the feedstock from which it was produced. “The fact that the HRS system offers batch reporting was also a big draw; traceability is very important to us and our customers,” remarks Lawrence Howes, Project Engineer at Muntons. First Published at Farming News on 5 March 2015. This entry was posted in Copywriting and tagged Anaerobic digestion, HRS Heat Exchangers, Muntons, Stowmarket on 6 May 2015 by Richard.